New York has been at the center of environmental debates, thanks to the state’s history of manufacturing, issues with lead in the water, and the Love Canal Tragedy. The state of New York has also attracted entrepreneurs, workers, and titans of industry throughout its history. In 2016, New York had a GDP of $1.5 trillion. If the state were a country, its GDP would be in the top 20 worldwide, ahead of countries like Russia, South Korea, and Australia. Balancing environmental concerns with the desire for growth means that many business owners and politicians are walking the tightrope. 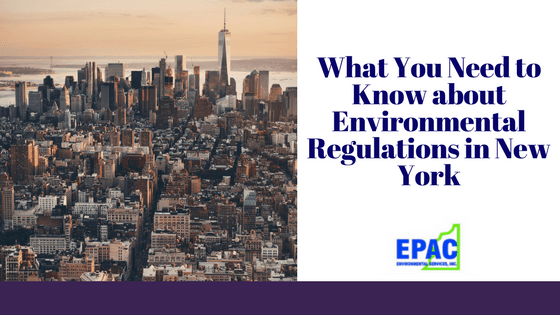 As a firm that does environmental consulting, we want you to know about regulations and how they may affect you. Air pollutants come from many human activities. Cars produce a host of harmful chemicals, such as hydrocarbons, carbon monoxide, and nitrogen oxides. In response to this, New York started a Motor Vehicle Inspection and Maintenance Program which helps ensure air quality. The inspection failure rate decreased between 2001 and 2014, but the waiver rate also decreased. It may be a good idea to check your car to make sure that it can operate in line with New York’s environmental regulations. If you run a company, and your company’s annual emission rate is equal to or greater than 25 tons per year of sulfur, nitrogen dioxide, total particulates, or carbon monoxide, you are required to obtain a permit and pay an annual fee. Fees can vary, on a per ton basis. New York has fairly stringent water quality laws. All waters are assigned a letter classification that regulates how the water should be used. For example, fresh surface water with a class of AA-Special is used for drinking, and there can be no nitrogen or phosphorus whatsoever. On the other hand, Class D fresh surface water is designated for fishing. Regulations are a little bit less strict when it comes to these bodies of water. Water quality standards are currently being reviewed to include nutrient criteria. You should also keep in mind that you can request to have a body of water be reclassified. This means that you can lobby to have the class of water revised if it is more convenient for your business. Another important factor to consider is that a lot of New York’s rivers and creeks flow into the Great Lakes. This is a major thoroughfare, and quite a lot of people get their water from them. There is a chance that the state will come down hard to protect everyone’s health. The state of New York has a Brownfield Cleanup Program. Any real property that has high levels of contaminants, in accordance with applicable regulations, is a brownfield site. There are a few steps you need to take before the authorities clean up your site, including looking through a pre-application worksheet and filing a formal application. There is a chance that the government may take this task on by themselves. If you have any questions about environmental consulting, we can help. Our company can perform your Phase I Environmental Site Assessment today. Contact us now. This entry was posted in Environmental Regulations on November 21, 2017 by wpadmin.